Good news to everyone because Lazada Malaysia had unveiled its biggest online shopping event in Shoutheast Asia. There are more than 1,000 brands and 55,000 international and local merchants participated this event which takes place from 11 November 2016 to 14 December 2016. This is Lazada's fifth Online Revolution since its inaugural launch in 2012. This year theme is "Brands for All" marks Lazada's evolution into a one-stop shop for Malaysian's favourite brands include Drypers, L'Oreal, Nestle, Samsung, Prodiet, Microsoft ZTE, Goon, Bosch, Tesco, Mattel, Sports Direct and more to go. The Lazada Online Revolution is the biggest online shopping and selling event in Southeast Asia bringing brands, retailers and consumers together in six countries. Started on 12.12.12, it is to educate consumers on online shopping and its conveniences. The one-day sale sparked a shopping frenzy that grew into an annual month-long event. Hans-Peter Ressel, CEO of Lazada Malaysia said that at Lazada Malaysia, they are committed to offering Malaysians access to millions of choices where 81% of their shoppers reside outside of KL with limited access to quality branded products and shopping malls. The Online Revolution themed, Brands for All is about bridging the gap between brands and consumers. They offer brands unparalleled access to consumers outside of metropolitan cities while they empower consumers to gain access to more than 1,000 brands that we love. Hans-Peter also said that they had a consumer demographic that is older, more diverse and more sub-urban. They are conscious of consumers evolving demands and aim to serve the needs of every Malaysian by offering unparalleled choice with a catalogue of over 7 million products across 17 product categories with their fastest moving products being diapers, groceries and small kitchen appliances. Shoppers like me can expect to discover more than 500,000 deals which include jaw-dropping offers from international and local brands as well as exclusive launches of branded items. Lazada Malaysia will also feature promotions from various marketing partners and customers will stand a chance to win free flights from AirAsia Big as well as special offers from Digi, Maxis, Domino's Malaysia, Caltex, HSBC, CIMB, TGV Cinemas and Maybank during the 2016 Online Revolution. More details at www.lazada.com.my. Thanks to Lazada Malaysia for their Online Revolution, Mommy Jane could save more while shop everything at the website and stand a chance to win many exciting prizes too. Thanks for the Parcel of Joy to Mommy Jane and Little Angels. 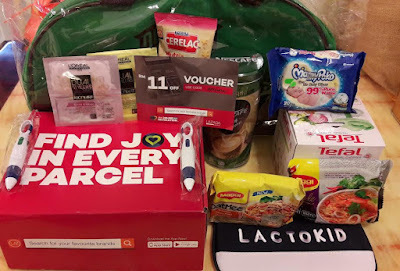 We loved the prize so much and will continue to support Lazada Malaysia for extra benefit and more savings in everything that we shop for. shall shop again before the sales end. Andrea, you're most welcome. Hope you will enjoy your shopping online now. Naim, enjoy your shopping as Lazada offered complete items for us to be pampered with. Been shopping like crazy since before 11.11! I don't want to look at my credit card bill. Boohoo! Emily, I'm sure you can save more with all the offers. Sarina, a great day for shopping. Heard about Lazada since long long time ago! Constantly many promos. Shini, Lazada helps us to save more. Crapppy, you're most welcome. Hope you could enjoy your shopping now. Betty, me too and items arrived quite fast too. This blog is just so interesting.